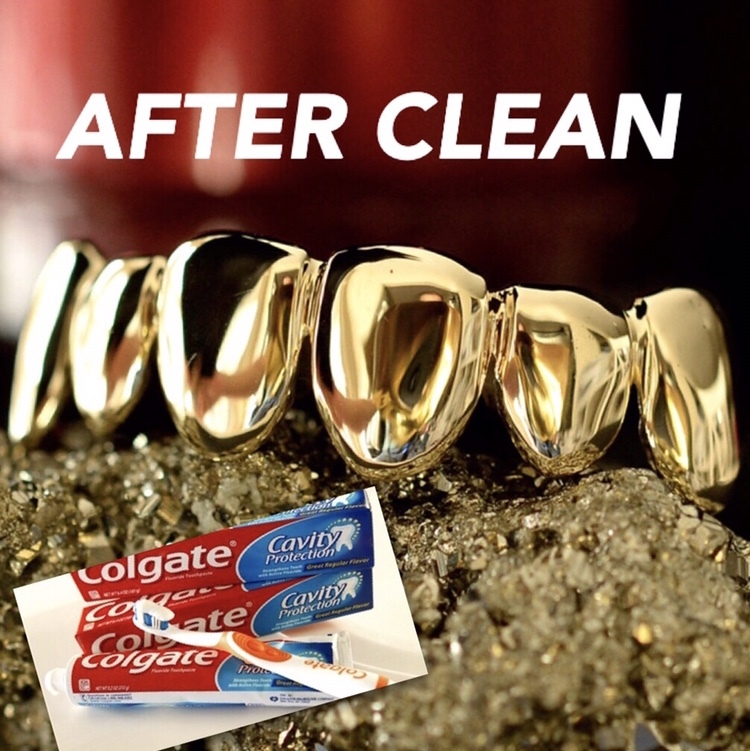 How do you clean your Gold Grillz? Home / Uncategorized / How do you clean your grillz? How can I make my Gold Teeth Shiny? Gold teeth are worn by all different types of people, and it is one of the hottest looks among the top Hollywood A-listers. Hollywood celebrities, singers, rappers, and even commoners all wear these products. Celebrities such as Rihanna, Nelly, Flavor Flav, and even Madonna have worn these gold dental accessories at movie premieres and Hollywood red carpet events. This popular trend has been on the rise since the 1980’s. 14kgoldteeth offers an exciting, bedazzled, and fun fashion accessory that anyone and everyone can wear, but it is important to learn how to keep it clean and hygienic. When people smile with their grillz, they want their products to shine so that they can show the world their bright smile. Since these items are always worn inside the mouth, people may wonder how to keep it clean and shiny. To begin, the grill should be removed from the mouth and rinsed off with warm or lukewarm water. After removed from the mouth, a soft-bristled toothbrush should be moistened with the warm water to gently scrub away any debris or bacteria that may have built up along the inside surface of the grill. Then, the grill should be dunked and soaked inside a glass of hydrogen peroxide for approximately 3-5 minutes. Once the time is up, the grill should be removed from the solution and rinsed and gently scrubbed thoroughly in warm or lukewarm water several times until all of the excess solution is rinsed away. Finally, use a non-abrasive cloth that will not scratch the surface of the grill to gently pat dry the gold teeth. There are four important key points to keep in mind when taking care and cleaning the teeth. The first way to clean the removable gold teeth is with a removable teeth cleaner. These products are special cleaners that are safe to use for removable teeth. We recommend cleaning the teeth daily with a non-abrasive cleaner that is designated for removable teeth to ensure the safety and health of the customer. After cleaning the product, rinse it with warm water and pat it dry with a soft cloth. Make sure to remove all of the water off the product. People can also ask their dentist for recommendations on cleaners for removable teeth. We highly recommend people to check the ingredients on the cleaner. If there are any questions regarding the product, always ask your dentist about certain ingredients that may be harmful to your health. It is good to shine your gold teeth every once in a while to maintain the luster by using a non-toxic gold cleaner. This can be done by taking a soft-bristled toothbrush and rubbing the gold cleaner gently, or as instructed by the manufacturer of the gold cleaner. You can also buff and polish the grill with a soft microfiber cloth in small circular motions to even out the buffing process. The second key point is to use a polishing cloth after the grillz is washed. It should first be washed and pat dry with a soft cloth to prevent scratches. Once washed, a polishing cloth will help retain the shine and luster of the removable gold teeth, so it will be shiny for the next use. People should shine the teeth before wearing it again. We highly recommend using a soft cotton microfiber cloth to polish the teeth because it consists of very soft cotton fibers that will not harm the surface of the gold jewelry. The third key point is to never use gold or silver jewelry cleaners. Gold or silver jewelry cleaners are different from cleaners that are specially designed for removable teeth. The effects of the gold and silver jewelry cleaners will not be the same as the jewelry you would wear externally versus the jewelry you would wear internally, like the gold teeth. It may also be harmful for your health if you ingest some of the ingredients because it is known that jewelry cleaners are toxic when ingested. There are labels on gold and silver jewelry cleaners that specifically warn people that the product is only for external usage and that it is harmful when ingested. We strongly suggest people to be careful and cautious to properly distinguish the two products, especially if they are displayed side by side at your local stores. It is always important to carefully read labels and check whether the product can be ingested. In addition, any type of polish should never be used on gold teeth because it may damage the teeth. Whether it may be a sterling silver product, yellow gold product, or white gold product, all of the grillz should be cleaned every time before wearing to prevent bacteria buildup. Specifically for sterling silver grillz, a non-toxic jewelry cleaner targeted for sterling silver should be used to maintain and polish silver teeth. Another way to clean your gold grillz is by using alcohol-free mouthwash. This can be done by first gently brushing the grillz with a soft-bristled toothbrush to remove any grime and debris with warm water. Then, fill a glass with the alcohol-free mouthwash and soak the gold teeth for approximately 5-10 minutes. After, the grillz should be removed from the glass and rinsed with warm water thoroughly and finally pat dry with a soft, clean cloth to polish and shine. The fourth key point is to not smoke. We highly recommend people to not smoke because smoking will affect the gold teeth. There are ingredients in the cigarettes that will cause the teeth to tarnish and make it lose its shine. It is important to note that the lower the quality of the gold teeth, the faster it will tarnish, if continuing to smoke. A higher quality of gold teeth will tarnish at a slower rate than opposed to a lower quality teeth, if wanting to continue to smoke while wearing the teeth. This means that the 10k products will tarnish faster than the 18k products if the wearer smokes while wearing the teeth. We highly recommend to not smoke with the gold teeth on at all. All grillz should be removed if wanting to smoke. After smoking, people should brush their teeth and mouth before placing the gold teeth in the mouth again. This will prevent the teeth from tarnishing and help elongate the life span of the grillz. The use of tobacco should be monitored carefully because similar to the effect of tobacco causing our teeth to turn yellow, it will tarnish the gold teeth as a much faster rate. When the grillz is not in use, it should be properly stored to prevent damage. The gold teeth should be stored in an air-tight case with a protective covering. It should be in a hard, protective case by itself to prevent any scratches or damages from other potential jewelry. Another tip is to put an anti-tarnishing strip inside of the container to prevent grillz from tarnishing. If gold grillz wearers do not take the time to maintain proper care of their jewelry, there could potentially lead to serious health problems. Without cleaning the grillz, bacteria and debris may build up inside it and may lead to enamel erosion and gum disease. Grills should not be worn for long extended periods of time as small bits of food and germs can collect on the inside and small crevices of the gold teeth. This will expose your natural teeth to harmful bacteria and acids that will eventually lead to sore or irritated gum tissue that could also cause a severe case of bad breath and other harmful effects. There are many benefits of maintaining your grillz properly. Because our products are custom made and are made of real gold or silver, it is a big investment. Maintaining this big investment will later down the road, keep the gold teeth in great condition and extend the lifespan of the luxury fashion accessory. With proper maintenance, you’re guaranteed to have a huge, flashy smile that will grab attention. If you do not maintain your grill properly, it will become dirty and tarnished and your teeth will also look unhygienic. Since gold tends to lose its luster over periods of time, regular usage of the gold teeth in the mouth can cause the gold to lose its luster much quicker than a gold accessory placed on the neck or wrist. The gold teeth should be cleaned after every use to keep it shiny, and it can be done with a quick soft brush and warm water or dunked in mouthwash. Keep in mind that a non-toxic gold cleaner will polish and shine your grillz when used periodically. For thousands of years, gold has been a prominent way of relaying one’s status of wealth and prosperity. Choosing a custom gold product made of entirely solid gold will last throughout one’s lifetime as long as it is maintained under proper care. As long as people keep these key points in mind while they wear the gold teeth, their products will retain their shine, luster, and cleanliness. Taking care of your removable teeth should be a daily routine, as if you were brushing your teeth daily. People should always remember to not eat while wearing the products, and to brush and wash the gold teeth at least once a day. By maintaining good hygiene, it will benefit the longevity of the removable teeth as both the natural state of teeth and the removable teeth need to be clean and healthy.